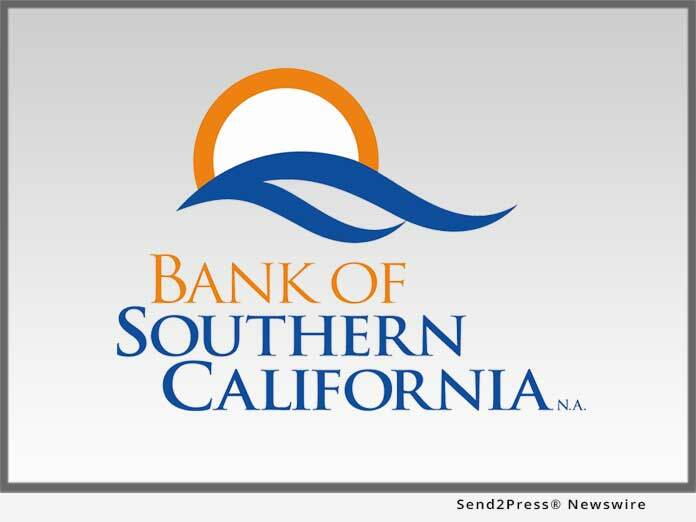 SAN DIEGO, Calif. /California Newswire/ — SAN DIEGO, Calif., Feb. 11, 2019 (SEND2PRESS NEWSWIRE) — Bank of Southern California, N.A. (OTC Pink: BCAL) announced quarterly net income of $2.0 million for the fourth quarter of 2018, compared to $875 thousand in the third quarter of 2018 and $1.1 million for the fourth quarter of 2017. For the year ended December 31, 2018, net income was $5.3 million compared to $4.0 million for the year ended December 31, 2017. Results are net of non-recurring expenses of $0.5 million in the fourth quarter of 2018 and $2.1 million for year ended December 31, 2018; these non-recurring expenses are related to the acquisition of Americas United Bank (AUB) in July 2018, and costs associated with consolidating a branch office in December 2018. Total assets at December 31, 2018, were $768 million, up 60% from $479 million at December 31, 2017. Total loans increased to $635 million at December 31, 2018, compared to $607 million at September 30, 2018 and $399 million at December 31, 2017, an increase of $235 million year over year. Total deposits were $628 million at December 31, 2018, down from $632 million at September 30, 2018, but up $220 million or 54% from $407 million at December 30, 2017. The increase in total assets, loans and deposits is largely attributable to the acquisition of AUB, which added approximately $190 million in loans and $203 million in deposits on July 31, 2018. Commenting on his prospects for 2019, Nathan Rogge said, “As we start the new year, we are keenly focused on continuing to position Bank of Southern California as a new banking option in the Los Angeles and Orange County markets, achieving our growth and revenue targets, and continue to develop best-in-class employees. We have already made progress on executing several key initiatives related to growing our presence in Southern California, implementing strategies to support our customer experience, and enhancing our employee training and engagement programs. “The bank continues to be well-capitalized and is well-positioned for further growth and expansion as we move forward to becoming Southern California’s Premier Community Business Bank,” concluded Rogge. * Net interest income for the quarter ended December 31, 2018, increased 19% to $8.0 million, from $6.7 million in the prior quarter, resulting from a 10% increase in average earning assets, an improved asset mix reflected in the increase in the average loan to deposit ratio during the quarter from 95% to 100%, and an increase in fair value accretion compared to the prior quarter of $297 thousand. Net interest margin of 4.59% includes 22 basis points of fair valuation accretion, an increase from 6 basis points in the prior quarter. This increase in fair value accretion was partially due to full implementation of “Day 2” fair value accounting and partially due to faster than expected loan payoffs in the purchased portfolio. Fair value accretion on a normalized basis is expected 12 to 15 basis points of net interest margin. * In addition to approximately $149 thousand in merger related expenses incurred during the fourth quarter of 2018, the Bank consolidated its branch office in Palm Desert and accrued $348 thousand in remaining lease costs during the fourth quarter of 2018. * Nonperforming assets were 0.45% of total assets at December 31, 2018, compared to 0.51% in the prior quarter. The allowance for loan losses (ALLL) was 0.69% of total loans at December 31, 2018, up from 0.65% in the prior quarter; however, when including $2.6 million in loan fair value credit marks (LFVCM), the ALLL and LFVCM represent 1.10% of total loans, up from 0.97% at December 31, 2017. * The Bank continues to be “well-capitalized”. After raising $26 million in capital earlier in 2018 and completing the merger July 31, 2018, the Bank reported total risk-based capital of 14.4% as of December 31, 2018, up from 13.5% at December 31, 2017. A growing community bank established in 2001, Bank of Southern California, N.A., with headquarters in San Diego, CA, is locally owned and managed, and offers a range of financial products and services to individuals, professionals, and small-to-mid sized businesses. The Bank’s solution-driven, relationship-based approach to banking provides accessibility to decision makers and enhances value through strong partnerships with its clients. The Bank currently operates ten branches in San Diego County, Los Angeles County, and the Coachella Valley in Riverside County, and production offices in Orange County and West Los Angeles. For more information, please visit https://www.banksocal.com/ or call (858) 847-4780. This news release may contain comments or information that constitute forward-looking statements (within the meaning of the Private Securities Litigation Reform Act of 1995) and Bank of Southern California intends for such forward-looking statements to be covered by the safe harbor provisions of that Act. Forward-looking statements can be identified by the fact that they do not relate strictly to historical or current facts. They often include the words “believe,” “expect,” “anticipate,” “intend,” “plan,” “estimate,” or words of similar meaning, or future or conditional verbs such as “will,” “would,” “should,” “could,” or “may.” Forward-looking statements are not guarantees of future performance, nor should they be relied upon as representing management’s views as of any subsequent date. Future events are difficult to predict. Forward-looking statements involve significant risks and uncertainties and actual results may differ materially from those presented, either expressed or implied, in this news release. Factors that might cause such differences include, but are not limited to: the ability of the Bank to successfully execute its business plan; changes in interest rates and interest rate relationships; changes in demand for products and services; the degree of competition by traditional and non-traditional competitors; changes in banking legislation or regulation; changes in tax laws; changes in prices, levies and assessments; the impact of technological advances; the outcomes of contingencies; trends in customer behavior as well as their ability to repay loans; and changes in the national and local economy. Bank of Southern California undertakes no obligation to update or clarify forward-looking statements, whether as a result of new information, future events or otherwise.